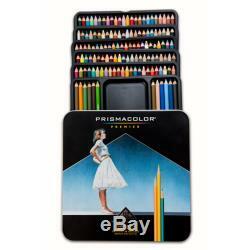 Premier Color Pencil Assorted Tin Case Set of 132. Thick cores of color last long to bring bold statements to life, while soft leads make them the best tool to blend in or shade away. They're vivid and intense in one stroke and subtle and soft in the next, making them perfect for any project, big or small. Smooth coverage and a wide array of colors to choose from make it easy to find a soft spot for these premium pencils. Set contains 132 assorted colors: Nectar, Seashell Pink, Sandbar Brown, Black Raspberry, Kelly Green, Moss Green, Artichoke, Espresso, China Blue, Denim Blue, Blue Lake, Caribbean Sea, Lemon Yellow, Light Green, Slate Gray, Marine Green, Beige, Indigo Blue, Ultramarine Blue, True Blue, Cerulean Blue, Aquamarine, Copenhagen Blue, Peacock Green, Dark Green, Grass Green, True Green, Olive Green, Apple Green, Spring Green, Cream, Canary Yellow, Sunburst Yellow, Orange, Non-Photo Blue, Pale Vermilion, Poppy Red, Scarlet Lake, Crimson Red, Carmine Red, Light Peach, Blush Pink, Pink, Magenta, Dark Purple, Violet, Violet Blue, Lavender, Black, Tuscan Red, White, Peach, Light Umber, Yellow Ochre, Burnt Ochre, Terra Cotta, Sienna Brown, Dark Brown, Dark Umber, Sepia, Metallic Silver, Metallic Gold, Lilac, Chartreuse, Light Aqua, Hot Pink, Process Red, Mulberry, Black Grape, Salmon, Yellow Orange,ish Orange, Yellow Chartreuse, Limepeel, Parrot Green, Imperial Violet, Parma Violet, Dahlia Purple, Jasmine, Clay Rose, Pink Rose, Rosey Beige, Celadon Green, Jade Green, Mediterranean Blue, Cloud Blue, Blue Slate, Periwinkle, Grayed Lavender, Peacock Blue, Bronze, Mahogany Red, Raspberry, Henna, Pumpkin Orange, Mineral Orange, Goldenrod, Electric Blue, Warm Gray 10%, Warm Gray 20%, Warm Gray 30%, Warm Gray 50%, Warm Gray 70%, Warm Gray 90%, Cool Gray 10%, Cool Gray 20%, Cool Gray 30%, Cool Gray 50%, Cool Gray 70%, Cool Gray 90%, French Gray 10%, French Gray 20%, French Gray 30%, French Gray 50%, French Gray 70%, French Gray 90%, Sand, Crimson Lake, Black Cherry, Violet Lake, Beige Sienna, Chestnut, Chocolate, Putty Beige, Ginger Root, Peach Beige, Sky Blue Light, Powder Blue, Muted Turquoise, Pale Sage, Kelp Green, Green Ochre. PRISMACOLOR® PREMIER COLORED PENCILS Soft, thick cores create a smooth laydown for blending and shading. Artist-quality colored pencils for every level of expertise. High-quality pigments for rich color saturation. Best tool for illustrating & coloring. Colors are primary hues, mid-tones, grays neon's & metallic's. This listing is currently undergoing maintenance, we apologise for any inconvenience caused. The item "Prismacolor Premier Soft Core Colored Pencils 132 Colors Tin Set 4484" is in sale since Wednesday, May 28, 2014. This item is in the category "Crafts\Art Supplies\Drawing\Pencils & Charcoal". The seller is "usartsupply" and is located in San Diego, California. This item can be shipped worldwide.